This book can be purchased from MennoMedia or Amazon. • Are children safe at your church? • What precautions have you taken to ensure they won’t be abused? • Do you know how to recognize the signs of child abuse and neglect? • What should you do if you suspect a child in your church or neighborhood is being abused or neglected? In the context of the Bible and faith, Let the Children Come helps Christians learn about their role in ending child abuse and neglect in all communities: church, home, extended family, neighborhood, school, work. Each chapter contains real-life stories, discussion questions and action items; the appendix includes prayers, readings, and exercises for use in adult education. 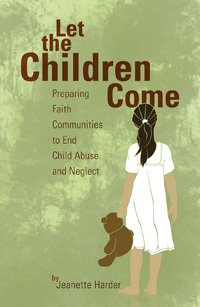 In the context of the Bible and faith, Let the Children Come will help Christians learn about their role in ending child abuse and neglect in all communities: church, home, extended family, neighborhood, school, work. Each chapter contains real-life stories, discussion questions and action items; the appendix includes prayers, readings, and exercises for use in adult education. What does the Bible have to say about abuse and neglect?